Darth Vader is the Black Pope - the Supreme Jesuit General - who serves his master the dark emperor Palpatine, aka Darth Sidious, who is insidious – slowly and subtly harmful or destructive. 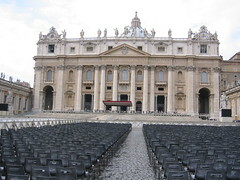 The word Palpatine is one “p” away from Palatine which is the central one of the seven hills of Rome/New Babylon where the double “p” – p p - pope sits in his evil lair of the Vatican. The Palatine Hill (Latin: Collis Palatium or Mons Palatinus) is the centermost of the Seven Hills of Rome and is one of the most ancient parts of the city. It stands 40 metres above the Forum Romanum, looking down upon it on one side, and upon the Circus Maximus on the other. It is the etymological origin of the word "palace" and its cognates in other languages (Italian "Palazzo", French "Palais" etc). According to Roman mythology, the Palatine Hill was the location of the cave, known as the Lupercal, where Romulus and Remus were found by the she-wolf that kept them alive. According to this legend, the shepherd Faustulus found the infants, and with his wife Acca Larentia raised the children. When they were older, the boys killed their great-uncle (who seized the throne from their father), and they both decided to build a new city of their own on the banks of the River Tiber. Suddenly, they had a violent argument with each other and in the end Romulus killed his twin brother Remus. This is how "Rome" got its name - from Romulus. Another legend to occur on the Palatine is Hercules' defeat of Cacus after the monster had stolen some cattle. Hercules struck Cacus with his characteristic club so hard that it formed a cleft on the southeast corner of the hill, where later a staircase bearing the name of Cacus was constructed. Rome has its origins on the Palatine. Indeed, recent excavations show that people have lived there since approximately 1000 BC. Many affluent Romans of the Republican period (510 BC – c. 44 BC) had their residences there. The ruins of the palaces of Augustus (63 BC – 14), Tiberius (42 BC – 37) and Domitian (51 – 96) can still be seen. Augustus also built a temple to Apollo here, beside his house. The Palatine Hill was also the site of the festival of the Lupercalia. In July 2006, archaeologists announced the discovery of the Palatine House, which they believe to be the birthplace of Rome's first Emperor, Augustus. Of course Ceausescu was not the Antichrist. His opposition to Christ and His gospel was much too obvious. Though it may mean "against," in Greek the prefix anti also means "a substitute for" or "in the place of." This is, in fact, the way in which the Bible presents the Antichrist. Rather than rejecting Christ, he will pretend to be Christ and thus will pervert rather than openly oppose Christianity. He will be a "false Christ" (Mt 24:24, etc. ), offering a "Counterfeit" a false and "positive" Christianity acceptable to all. I hope you are well, in good spirit and will not make the same very foolish mistake that your predecessor made – that of ignoring me and suffering for it for years, until it finally killed him. Karol Wojtyla/John Paul 2 refused to give The Vatican to me and as a punishment he got sick, then gradually sicker and sicker as time passed, as a very clear sign to the world that he was, in reality, evil and being punished by God, because he refused to give me what is mine by divine right. You served him for that period of time and saw exactly what happened to him, first-hand, for yourself. Undoubtedly the foundation for both the Roman Catholic Church (RCC) and the Protestant religions to which she gave birth is built on certain immutable truths…or is it? Taking a hard look at some of the core teachings in Catholicism and all Christian based religions reveals a number of inconsistencies and misconceptions. The stark contrast between The Bible and official RCC doctrine would seem to indicate that most (if not all) of the basic precepts are in error. What follows is a scripturally-based, objective examination of these core teachings for your review. The following, as deciphered from caves 1, 3, 4 and 7, are deemed sensitive and remain unavailable for public inspection by those who seek to control the Truth for their own devices. These texts remain the property and jurisdiction, of the elite, who secreted them away to the four (4) major religious organizations and other various agencies as they were found beginning in 1947. Those being the Jordanian controlled Rockefeller Museum in Eastern Jerusalem, the Department of Antiquity in Israel, the American School of Oriental Research, the Rockefeller Foundation and Israeli Biblici of Archeology. Other scrolls and remnants remain in the strict possession of the Vatican and Royal Museum at Leningrad under extreme security measures. The educated scholars, and those involved with deciphering the scrolls proclaimed the texts, "contained no valid information that would shed any additional light whatsoever on the advancement of Christianity in Jerusalem." Their claims, to this day, denounce the possibility of any intrinsic value, historically or otherwise being placed on the scrolls. And that is exactly what can be obtained from the Internet or through the Library of Congress. Parchments and fragments that are handpicked, and safe, being of no significant, intrinsic value. In reality the scrolls reveal secrets regarding the literature of the Messianic movement in Palestine, secrets concerning The Great Flood account, spiritual visions and revelations, exciting experiences including personal accounts of those who knew and practiced the truth, revelations regarding space, contact and communication with those of other worlds and unique experiences with Angelic beings. Additional scrolls shed light on, "The unlawful execution of a certain Messianic leader in Jerusalem," which continues to cause much contention and controversy to this day. These revelations remain too hot for the religious hierarchy and other authorities to handle and the reason behind the immense and deliberate cloak of secrecy. Why? Because such information was/is, "too powerful or complicated for the common man to understand, interpret or appreciate." It is no coincidence that these truths have become available, accessible by anyone without limitation or censorship. They are the Words of the Almighty Creator as well as in the personage of our Lord and Master Jesus Christ. Are you aware of the Jesuit connection between Pope Pius XII and SS General Karl Wolff, the criminal who sent Rome's Jews to Auschwitz? Pius 12 blessed Hitler (the anti-Christ of Revelation 13) and called him "The Envoy of God". The Jesuits were formed by a baptised counterfeit-Jew named Ignatius Loyola and thus the persecuted counterfeit-Jews took control of The Vatican - JAH. They shall go to confusion together that are makers of idols. In the mathematics of the Church of Rome, ten minus one equals ten! This is neither a miracle nor a conjuring-trick, but a blatant and purposeful deception as well as a conscious perversion of the Word of God. It is achieved by deleting the second commandment and making the tenth into two. This third prophecy of Fatima is incomplete because the young girl who became Sister Lucia was told that Satan is ruling the world through The Vatican, for which they beat her, trying to force her to recant and say that she had lied. When she refused to do so, they cloistered her in a convent for the rest of her life, so that she could tell no-one the third prophecy. Company, ISBN 0-681-20227-0, page 458.
reserved. Developed for Microsoft by Bloomsbury Publishing Plc. Hence known as The False Prophet and the Whore in Scripture.